This recipe, a near clone of our Turkey and Dumplings, is quick to assemble; parts of it can even be done in advance. 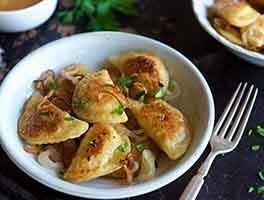 Self-rising flour makes the dumplings both tender, and easy. To make the dumplings: Place the flour into a bowl, and work in the butter until the mixture resembles coarse bread crumbs. Stir in the herbs. Cover and refrigerate while you make the filling. To make the filling: Melt the butter in an oven-safe, 3-quart saucepan over medium heat. Whisk in the flour; cook for 1 minute. Add the broth 1/2 cup at a time, whisking it into the flour and butter to prevent lumps. When all the broth has been added, season with the thyme, bay leaf, salt, pepper, and Worcestershire sauce. Simmer the sauce for 15 minutes, then stir in the chicken and vegetables. Keep the mixture at a low simmer while you finish the dumplings. To finish the dumplings: Whisk the buttermilk and egg together and add to the dry dumpling mixture, stirring just until evenly moistened. To assemble: Scoop the batter onto the simmering filling, using a muffin scoop or 1/4-cup measure. Leave some space between the dumplings; they'll almost double in size as they cook. Put the lid on the pan, and bake for 20 minutes, then uncover and bake for another 5 to 10 minutes to brown the biscuits. Remove from the oven, and scoop a dumpling and a portion of the filling onto each serving plate. Serve hot. Yield: 7 to 8 generous servings. My husband and I made this together for dinner tonight and it was AMAZING! It really wasn't hard to do and everything turned out beautifully. The dumplings are my favorite part - we used fresh chives and dried parsley. They baked up perfectly on top, but didn't get very brown after the extra 10 minutes, which is fine with us. We added a full tsp of Worcestershire sauce and I think that really helped. Couldn't find dried thyme so we used fresh and it was great. I baked boneless, skinless chicken thighs seasoned with salt, pepper, and garlic powder, and drizzled with a little olive oil, at 425 for about 25 minutes before starting the recipe and just cut it up when it was time to add it. Don't forget to take the bay leaf out before you add the chicken and veggies and top with the dumplings! 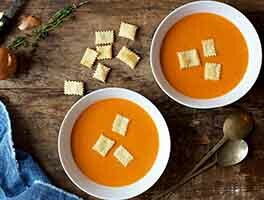 :) Great recipe - ultimate comfort food for a cold Winter night. Thanks KAF...I always know your recipes will be stellar. So good and easy. 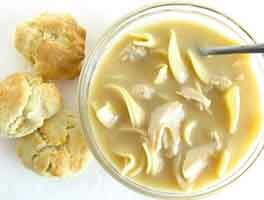 I generally dislike chicken and dumplings- the dumplings always seem raw and doughy. These dumplings were perfect- totally cooked through. Perfect recipe for leftover rotisserie chicken. I made my own self-rising flour (that you for having a recipe page for that). I used chives in the dumpling dough. I made this recipe for my granddaughter who is has an allergy to all milk products. I used margarine in place of butter and chicken broth/almond milk mixture in place of the milk. It was the best chicken and dumplings I have ever made. My family could not get enough of it. I was so happy to find your recipe! I made this recipe last night and it turned out very well and smelled delicious. I did have to remake the dumplings because I accidentally used all-purpose flour on the first try instead of self-rising. An easily fixable mistake. I did make three alterations to the recipe. 1. I replace 1/2 cup of the frozen peas and carrots with frozen corn. 2. I pre-baked the dumplings on a sheet pan for 10 minutes, then cooked them for the remaining time as directed. This made sure that the dumplings were going to be fully cooked at the end and not doughy. 3. I added a little extra chicken broth to compensate for the slightly drier dumplings absorbing some of the liquid. Just made this recipe for dinner...it was a HUGE hit with my husband and teenage son. However, my husband had difficulty finding a store that carried the self-rising flour, but he finally found it at the third store. Unfortunately, when he got home I noticed the use-by date has passed so he had to return to the store for an exchange. I agree with other reviewers...the filling to biscuit ratio is off; I will simply double the filling recipe next time. For a single recipe, I also increased the stock (did not use broth) to four cups (one whole box). Also, to resolve the problem that I and other reviewers experienced with the biscuits not browning, I simply put the casserole under the broiler for about two minutes. They came out slightly crispy on top and golden brown. If it weren't for these minor issues, I would have given it five stars! Will definitely make again! We thought this was in general, a very good recipe. I would suggest doubling the stew part of the recipe because it seemed to us that it had more dumplings than the stew could reasonably accompany. I had one problem, however, but since it was my fault and not intrinsic to the recipe, I didn't downgrade the stars for this issue at all. I do have one question -- I prefer to use KA WWW Flour, and found the dumplings to be a little bit heavy. Not bad, just not quite fluffy enough. Is there an alteration to the recipe that you could suggest to mediate this problem? Would any of these ideas solve the problem? - Increase the baking powder & soda by 10-25%? - Increase the liquid a bit? - Just have a cup of tea and a good cry, then bite the bullet and use unbleached flour next time. Very tasty and the assembly couldn't be easier. Early in the day, I cooked a few chicken breasts that I seasoned with s&p and put them in the 'frig. Before dinner, I cooked and assembled the rest of the meal. The only thing was that I didn't use the Self-rising flour - ugh - which meant the dumplings had a bit of a "doughyness" to them. I didn't realize it called for self-rising until I noticed the dumplings didn't rise and I kept thinking that perhaps I missed a leavening ingredient. It was still very tasty - although next time I'll get it right. I used freshly chopped chives and I thought they lent a nice fresh flavor to the dish. I did use a 32oz. container of chicken broth instead of the 3 cups that were called for. I could tell right off that there wouldn't be enough liquid so I tossed in the additional broth and it worked out great. Next time I'll add the 32oz. container and an additional cup of broth for good measure. After it finished baking, there wasn't enough of the broth (for my taste, anyway). One other thing though - my dumplings didn't brown - I saw the note to another reviewer afterwards so I'll take that into account next time as well. I'd also like to use this recipe for homemade chicken pot pies (without the additional cup of broth as indicated above) - I think it'll be fabulous put into ramekins with a nice flaky crust on top. The filling (as its called) was tasty with the herbs, bay leaf and s&p. 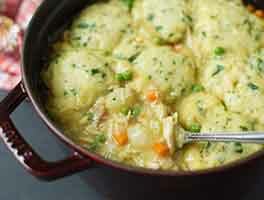 It had a wonderful fresh, homemade flavor to it - much, much better than other chicken and dumpling recipes I've come across. In other words, it's a keeper. 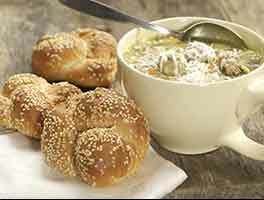 Great recipe -- delicious. I made the dumplings without the egg, and it worked fine. I also reduced a 1/4 c wine down to a syrup and added it -- really added a great flavor. Family loved it. The only issue - and it's not really an issue - is the dumplings did not brown on top. Even with an extra 10 minutes. But everyone loved it!